Darlene McInerney brought a blanket for this 15-year-old dog who needed some immediate attention (he'll be fine). His human stayed outside with him instead of going into the shelter. "He's more comfortable out here," she said. Photo courtesy of Staci Wilkes. Long Beach resident Darlene McInerney found she couldn’t sit still after reading a Facebook post, Saturday, Nov. 10 by her friend Staci Wilkes. Wilkes, founder of street outreach organization The Compassion ProjectLA, was on her way to Pierce College in Woodland Hills where the Red Cross had set up an evacuation center for people affected by the fires. The campus was housing farm animals, horses in particular, and was also accepting small house pets. A couple of tortoises came crawling in as well. McInerney operates like that. She’s an exceptionally kind, giving human being who manages to keep a sense of both humor and balance in her efforts. She has to, she volunteers for at least three local pet welfare organizations, last I counted anyway, and she keeps in shape through her work as a fitness instructor. She was ready and willing to contribute anything to help the Red Cross and Operation Blankets of Love (OBOL) assist and comfort the swelling number of people and their pets that were seeking shelter at Pierce. OBOL is an animal-welfare organization that does what a lot of animal-welfare organizations do, but on a grand scale and then some. The organization helps at least 1,000 animals a month. Their mission is to provide the comforts of home to pets in shelters and rescues and to animals owned by homeless people. As a partner to the Red Cross and other organizations, they work as an emergency response team to help animals displaced or endangered by catastrophe. And they sure were needed for this one. At the peak of the crisis, 1,110 people, their pets and 75 Red Cross personnel were staying in the Pierce College gymnasium. Pets were allowed to stay with their humans only if they were in crates. OBOL provided crates for anyone who needed them, including the two tortoises. They also gave out pallets of dog, cat and rabbit food pets with them if they have crates. Brad said that by the time they packed up, most of the people had left, with 100 remaining. 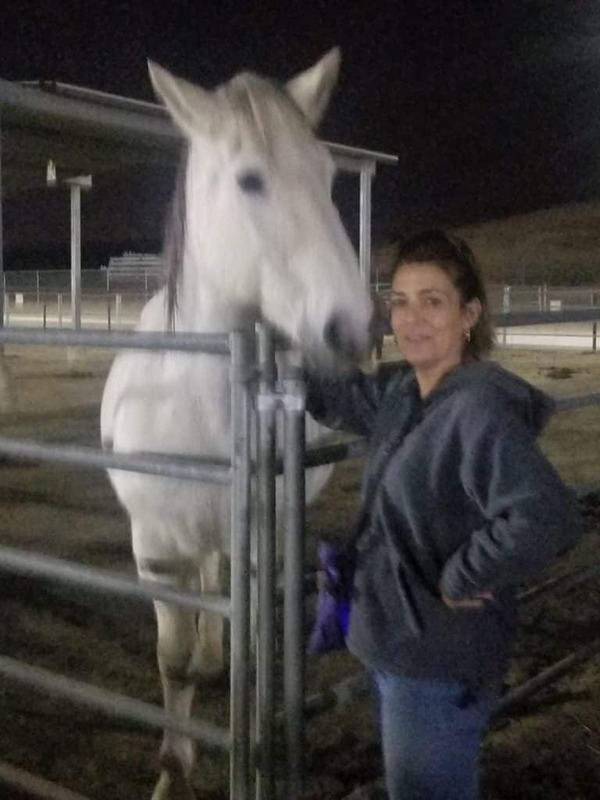 Doreen Clay, public relations manager for Pierce College, said that as of Nov. 13, the campus housed 153 horses, 20 mini-horses, five donkeys, eight goats, six sheep, 14 chickens and two tortoises. 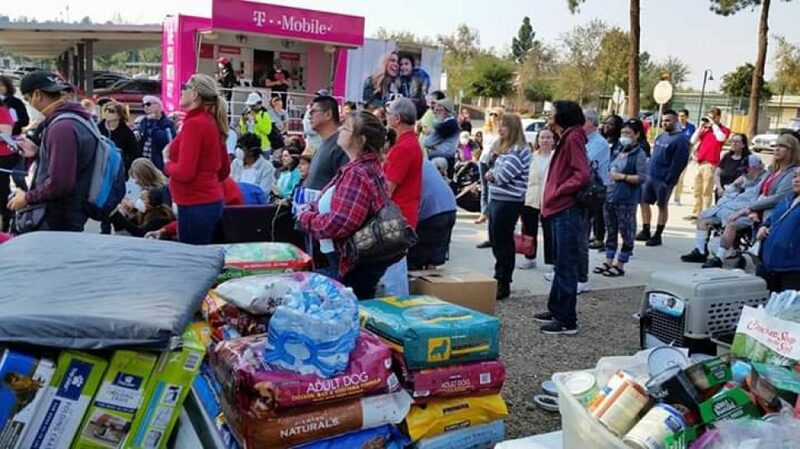 The County of Los Angeles Department of Animal Care and Control brought in a couple of trailers to house the five dogs and 11 cats that were found. Brad, Eileen and the rest of the group acknowledged the generosity as well as the hands on deck and boots on the ground. “We had a ton of offers of help, and a ton of donations came in,” Brad said. Generosity abounded at the Red Cross evacuation center at Pierce College. The donations outnumbered the evacuees! Photos courtesy of Darlene McInerny. Normally, we take in large animals, but the sheer numbers of people being evacuated inspired us to do this,” Clay said. Pierce College has an equine-response team that cares for evacuated horses. Clay said that the college is situated in an area where people keep horses and that they are always able to provide space for them. Seeing the goats and chickens and the number of tagged horses, some with their owners’ phone numbers spray-painted on their necklines, affected McInerney deeply. “It was heartbreaking,” she said, with a catch in her throat. Horses have a safe haven at Pierce College whenever they need one. Photo courtesy of Darlene McInerney. McInerney was, however, struck by the organization, along with the generosity and kindness, that came out of the chaos of the fires. She plans to assist OBOL in the future. Donations to OBOL can be made here. The Foundation for Pierce College accepts donations for several programs; note farm animals on this page for the Equestrian Evacuation Center. Donations for the Red Cross in Los Angeles can be made here.